Most healthcare protestors look like this. Their signs might say they opposite, suggesting that Obama’s proposed health plan might not be the way to go, but they’re still pretty sane. 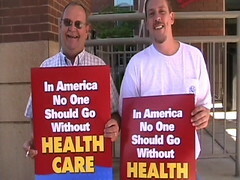 They’re not, for example, holding up signs that say Death To Obama, and threatening his family. Folks, this is the kind of stuff that’s so just plain absolutely positively off the reservation that makes me hate the debate that’s started, just for all the breathless crazies.